The apple doesn't fall far from the tree... no, wait, from the photo rope! Thanks to strong neodymium magnets, each apple securely holds your postcards, photos and shopping lists on the photo rope. 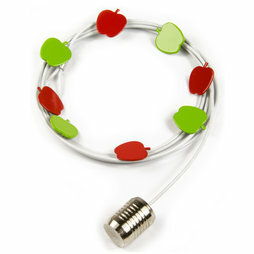 Delivery includes a 150 cm long white plastic-covered photo rope with steel weight and eight magnets in an apple shape.